When creating a search results page, it’s unfortunately too easy to produce an ineffective design. We know this because, in the course of our research, we’ve studied hundreds of search results pages. Many of the pages we’ve studied hurt the user’s experience purely because of their design. A slew of problems occur when users encounter an ineffective search results page: Users can’t identify what is relevant to their search. Many of the links are irrelevant to them. They find it hard to tell the differences between the various results, making the choice difficult. These problems force users to click into each result, often ending with them abandoning the search altogether. The good news is we’ve seen many effective search results pages. This means there’s hope. It also means we can start to look for patterns that separate the effective designs from their less effective counterparts. In our research, every time we found a site where the search results were doing what they should, we also found a team that had worked really hard to make it that way. Those teams all have something in common. They’ve experimented thoroughly, trying out dozens of designs and repeatedly watching users. They’ve frequently scoured their search log data, studying the terms users employ and comparing them to the results the site generated. They’ve ended up with great search result pages, but it has taken months (and in some cases, years) of constant studying to get to this point. There is no way, as far as we know, that you can produce a great search results page without spending the time and effort to build it. We know from watching users that, on most sites, they use Search after they’ve scanned the page for their trigger words. Trigger words are the words that will ‘trigger’ them into clicking on a link. If they can’t find their trigger words, only then do they turn to the search box. And, what do they type? Their trigger words. Once they start searching, everyone has a similar expectation: a search results page that will move them forward in achieving their goal. When we talk to designers about how they approach the search results page, they tell us they want to give their users a list of great choices from which they’ll choose. This approach focuses these designers on creating a showcase of choices. The showcase leads developers to think choices are a good thing. However, here’s an interesting finding from our research. Users don’t necessarily want to choose. They aren’t looking for a showcase. They are looking for the magic item that will solve their needs. If the system can’t figure it out, well then, they want to see the selection that contains their magic item. But, if the system only provides a single magic item, they’ll be happy—assuming it’s exactly what they want. Instead, we’ve found the best designers don’t take a showcase approach to the search results page. They look at the users’ objectives and try to find ways to get the magic item in front of them. Of course, what makes an item into “that item” will vary based on the user’s tasks. 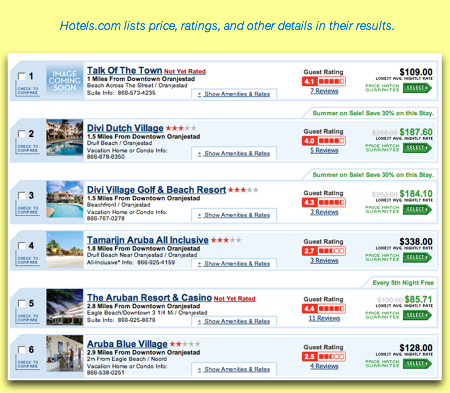 For example, someone looking for hotels in Aruba may type “Aruba” into a hotel site. There’s not a lot of information here other than they are looking for a hotel in Aruba. But that doesn’t mean the search is generic. That user could be looking for the cheapest hotel in August. Or, they could be looking for the hotel they’ve heard has a private island. Or, they could be looking for a hotel that is hassle free, since they had a horrible experience last time with dirty rooms and bad service. Or, they could be looking for a hotel that is right on the beach. Users don’t wake up in the morning thinking a good day will be a day filled with search queries. They have specific goals and objectives, based on their current scenario and context. Design teams with solid personas with well-defined scenarios will find the design process to be easier, since they can derive specific search tasks right from the scenario descriptions. In looking at how users think the search process works, we learned that the results don’t have to be the exact page the user is seeking. They are not expecting their answer to appear as soon as they press the Search button. The users also don’t need the search results page to contain a link to the page with the answer. Instead, users are looking for something that moves them forward. They don’t care how many clicks it takes, as long as each click is clearly getting them closer to their goal. 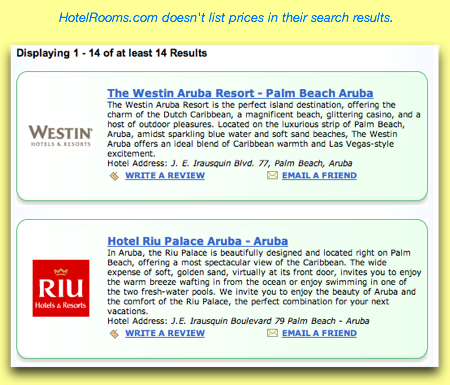 In the search for an Aruba hotel room, the search results page wouldn’t have to provide a detailed list of the specific hotel rooms (“A king suite with an ocean view for $79 a night”) that are low cost. It only has to provide good scent that tells the price-sensitive traveler that, by clicking on the result, they are going to end up with a room that matches their criteria. For example, HotelRooms.com, when given the search term “Aruba”, gives detailed descriptions of each property, but no prices. This won’t help the price-sensitive traveler scenario. In contrast, Hotels.com shows price, distance from important landmarks (like downtown), and ratings. In fact, many of the best hotel sites don’t present travelers with any room specific information in the search results. Instead, the results focus on the hotel properties. Only once the user selects a property do they learn what their room choices are. For example, on Marriott.com, a guest only sees the available rooms once they select a specific hotel. Search results don’t have to bring you directly to the final page. They just have to bring you to a page with even better information scent than the page you just had. In part 2 of Producing Great Search Results: Harder than it Looks, we’ll talk about how information scent works on search results pages and what designers can do to build more effective experiences for their users. Published here on July 9, 2008. 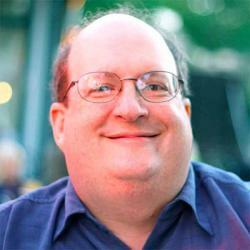 Your Job Ad: The Start of a Great Hiring Experience by Jared M. Spool Jared Spool tackles the pitfalls and benefits of job ads: to design a great hiring experience, we need to understand the goal of the job.